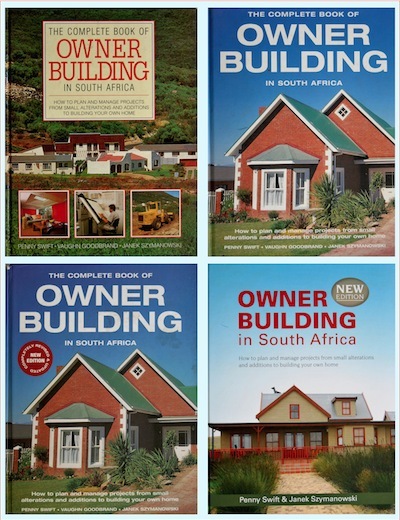 Having just finished totally updating the ever-popular title, The Complete Book of Owner Building in South Africa I am left wondering whether owner building is a good idea or not. We’ve completed the exercise three times, and not once made any money, or in fact even got our money back on any of the projects. So why would it be a good idea for you? You might perhaps see it as a challenge? Or maybe it is an opportunity for you to prove you can do it better than me. Maybe you’d do it just because you can! If you get it right, you could save yourself a lot of money and end up with your dream house. Now if you’re wondering why this would persuade you to buy the new version of the book (which will, I believe be available from Random House Struik sometime during 2012 … hopefully before the world ends), the one thing these building exercises did teach us was what not to do! With this knowledge, we have put together a title which hopefully will help you achieve your dreams. We have also discussed every aspect of construction in relation to the local national building regulations. And there are lots of good ideas and beautiful photographs of other people’s construction projects and finished homes and gardens. One’s first experience of anything is always special in one way or another. We had managed to buy two tiny seaside plots with a small inheritance, and decided to build on one and then sell it to be able to build something on the second – for ourselves, rather than resale. The first project, we thought, would pay for the second. The idea is a good one, but firstly you need sufficient money to achieve Plan 1; and then you need to be sure that you will make money on it within your time frame. In reality, even many full-time property developers have to wait a while before they make money on developments. And they usually have multiple units to sell, so they make money back progressively, over time. We had a minimal budget. We spent more than our budget. Then we needed to sell quickly. A downturn in the property market hit us hard, especially since this building venture was in a relatively remote spot that was, at best, an up-and-coming holiday spot. The fact that 10 years down the line the area began to blossom, was irrelevant in the scale of things. It was too late. The house was basic, but sweet. We couldn’t afford decorative finishes, or even basic appliances (like a fridge and stove), so that we could at least make use of it – or rent it out and recoup some money. We had to sell, and were becoming desperate. After an unsuccessful auction, a qualified professional in the building industry bought the property for a song. We didn’t get enough out of the project to build on the second plot, and eventually lost that too. This time we did it correctly, or so we thought. Certainly it was as right as we could have done it, but because we were owner-building, the buck stopped with us. We had nobody else to blame for errors, even if we didn’t make them ourselves. We bought the plot, secured the finance to build using a solid quantification and costing programme, and then got down to work. So what went wrong? Two major factors worked against us. The so-called professional who helped to survey the site didn’t pick up that we were building on a slope. The property looked flat enough, and we weren’t advised to formally assess the slope. Nobody realised that our neighbour’s soakaway drained way into our property, until after our foundations had been dug – not even the municipal health inspector. That was enough to destroy a half decent budget. Not only was the slope considerably more substantial than everybody seemed to think, but we had to move the entire build forward to avoid the health hazard of the illegal soakaway (or French drain) behind us. It didn’t occur to us that we might have a claim against our neighbour. So we went ahead and built the house which, I have to admit, while spacious and full of architectural features (for example, we only used doors and windows scavenged from demolition sites) had a few other follies. The most expensive of these was a long – admittedly very handsome – passage leading from a glorious front door we had rescued from some huge wonderful building we never knew. Our fabulous folly in the form of a three-metre wide passage and ultra-high ceiling. The front door, complete with windows was rescued from a demolition site. The unusual wall sconces were a gift from artist and metal sculptor, Carrol Boyes. 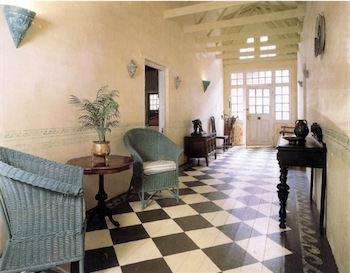 The floor was ordinary SA pine floorboards, painted with PVA and sealed. The slope also cost us, because the foundation wall at the back of the house ended up over 2 m (or 6½ ft) high. Then there was the fill which had to be transported to site to fill the void. Apart from the obvious additional costs, the major impact of the follies and mistakes (be they ours or other people’s) was that we weren’t able to finish the build according to schedule. We didn’t particularly care, but the bank insisted we finish. Bank managers visited the site and introduced their own tough tactics. When you owner-build you will negotiate draws with your bank. If they release 100% and you haven’t finished the house, you have a problem. This is what happened to us, and the bully-bank (totally within their legal rights) forced us to take another loan to finish ceilings and other things that we believed we could temporarily live without – including the lounge floor. The house was huge and large enough to temporarily board up the lounge. But the bank wanted everything complete, IMMEDIATELY, if not sooner. Could we have said no? In retrospect probably yes. But they forced us to take a personal loan that we couldn’t afford to repay. Certainly today the relatively new Consumer Protection Act would have precluded them from doing this. So we did put in some ceilings, including a glorious kitchen ceiling that incorporated a steel pressed section from a Victorian building that had been demolished in Claremont (Cape Town). Eventually the house was sold … and then sold again … I’m not sure how many times. Some years ago, when the house was on the market and there was an open-day show house, we discovered that a later owner had carefully removed the fill, and created an extraordinary double-storey home. We wished we’d been able to buy it back again. Now we knew it all! What could possibly go wrong? In an endeavour to avoid potential problems, we employed an architectural designer to draw the plans, and a full-time builder to do the build. What we had “forgotten” was that the builder – at that stage also a friend – was the so-called professional whose advice led us to believe we had previously been building on a virtually “flat” plot. So retrospectively, we had only ourselves to blame. But if the NHBRC had been in existence at that time, we would have been saved a great deal of heartache. Since we had to raise a bond to build, the contractor would have not have been acceptable to the bank unless he was a paid-up member of the NHBRC. In a nutshell, we were ripped off by a bogus builder. Sure this is what he did full time, but his reputation was so bad that when we later tried to sell the house, property agents wouldn’t touch it with a barge pole. The wall on one side of the house was a brick course higher than the other, so the roof wasn’t quite level. The walls inside the house that should have been bagged with plaster and been vaguely and unevenly smeared with a very weak mix. When we complained the builder set to work with a box of Polyfilla, in an attempt to even the surface. Nails had been left protruding from exposed beams. The brick-paved driveway was lifting and falling to pieces. Worst of all, he had run out of money and wasn’t able to complete the build. Eventually we did sell, and were able to repay the bond to the bank. But that was the end of it. So would I ever owner-build again? And if I did, how would I do it differently? I might, but only if I had the money to pay good sub-contractors and proven artisans that I could really trust to do a good job. And I would be sure to take every bit of my own advice given in The Complete Book of Owner Building seriously! But for now I’m content to rent. I had house renovation plans approved to use cement tile roofing. But now I’m thinking of using metal sheeting as my roofing material. Can I just go ahead and do this or do I need to get approval for that change? Hi NKululeko, A different roof covering will require a different roof truss design so to answer your question, yes you will need to get permission and alter your plans accordingly. You will need approval for the change – apart from which, depending on the original cement tiles specified, there may be a difference in terms of purlins or battens in terms of size and spacing. Hi Penny, do you have any info pertaining to A-frame houses, I want to build one and was wondering if there are any guidelines? Mike the building regs apply to all buildings. The NBR doesn’t deal with specific building methods or building types and styles. Since A-frames are generally timber frame you will need to pay particular attention to the sections of the regs that deal with timber walls. Foundations, plumbing +++ will all be the same as any other building. You might find a book (probably American) that would help you. Sorry I can’t be more helpful. I want to know the next step I have to take when building a new house. The plan has been approved by the municipality, so I want to know what I should do next. Get quotes from builders who are registered with the NHBRC and then contract one to build your house for you. Good luck. I am building a house from scratch currently waiting for approval of plan from the municipality.Building material is ready for building I will only wait for the NHRBC 15 days waiting period after we get the building plans from municipality.I keep on worrying that l am missing something.I am a perfectionist is there an advise for me to make sure l am on top of my game. Sorry I don’t understand the question. If you are waiting for the NHBRC it sounds as if you are registering with them – or using a builder that is registered. If you are owner building you need to apply for an exemption. In any case, in terms of the building regs you need to have a competent person involved in the build. This person should be able to tell you if you are “missing something.” Good luck with your build. I have a vacant plot and have just had my building plans approved. Regarding electricity, water and sewerage, when is the right time to apply for such services? Generally the sooner the better so that you have water and electricity on site for building. Sorry but we only give help with online queries. The best is to contact an architect as they are experienced in all aspects of the industry. I am a non resident, have approved plans, have appointed an engineer. Therefore my question is do I require an owner builders permit or exemption to owner build. The structure is Light timber frame and my trade background is carpentry. Hi Stephen, Apologies for the delay in our reply. It has nothing to do with being a non-resident but everything to do with constructing a new building on a property. You can apply for an owner builder exemption from the NHBRC but be aware that you may not sell the house for a period of 5 (five) years if you do this. You can also project manage your own build but you will have to complete a short questionnaire with the NHBRC has set to demonstrate that you have the knowledge to oversee the build. Thank you for your reassuring and informative reply. I have a plot in an estate in South Africa, Pretoria. 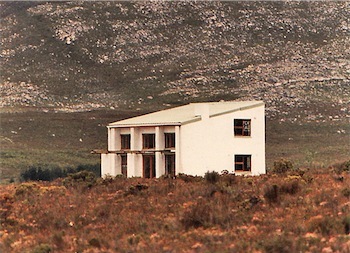 We stay outside South Africa and would like to hire a builder and buy the material and finishings ourselves. How much is reasonable these days per square metre in South Africa if I am providing the material and just need the builder? I am receiving all sorts of varying quotations. We paid up the plot and so we were hoping that we are cutting out all the extra bank regulations. Unfortunately we can’t help you Tembisa. Hi regarding extensions,once a plan has been approved and foundation done,is there a time period to complete building or can i complete as my budget allows? H Jerry, Here is a quote from the City of Cape Town FAQ’s: “A building plan is valid for 12 months from the date of approval. You may apply in writing to your local district planning office for an extension before the expiry date. ” and as far as I know most municipalities in SA do the same. I built my own house back in 1993 and as per Janek the building plans are valid for 12months, however that means you have to start your build within 12months of the plans being approved, otherwise the approval will be cancelled, however once you have started to build I believe there is no time line for completion, there certainly wasn’t in my case. I want to build a house with hollow bricks. Some say you require 11 bricks per sq.meter. Is it true? and does the building regulations allow hollow bricks for external walls. and is it compulsory to plaster those walls as per building regulations. Yusuf it depends on the size of your blocks or bricks. When you say hollow, you are clearly referring to blocks. Two of the common sizes are 390 x 140 x 190 mm and 390 x 190 x 190 mm and you will need about 12 and a half blocks for every square metre you build. I want to build a house, but I do not have any building knowledge what so ever. I have tried to look on the internet about building regulations and so on but can not find very much. I want to take a bond to buy the land but personally finance the actual building and do as much of the building my self. Would you know where I can find regulations on owner building? Charlene there is everything about Building Regulations on this web site. 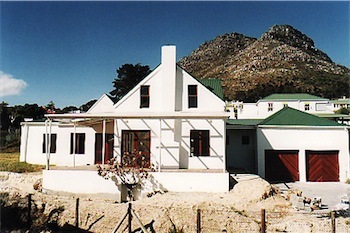 We have a second website http://www.ownerbuilding.co.za that has additional information. My book Owner Building in South Africa might also be helpful. Could you please reconfirm the link http://www.ownerbuilding.co.za as it says page not found.